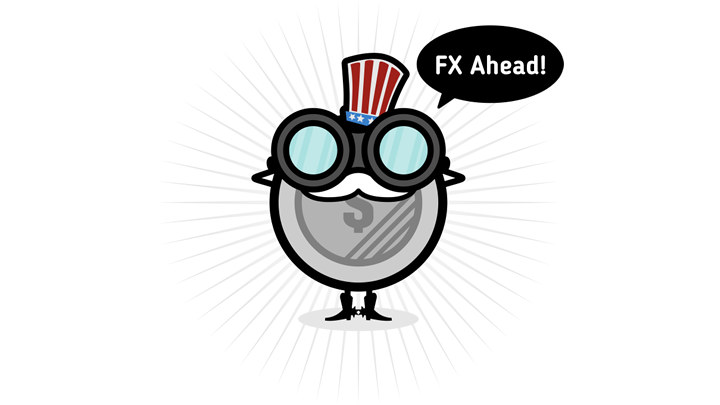 Dollar price action was mostly mixed in the previous week as counter currency movements were strongly in play. Still, a bit of risk-taking and indications that the FOMC could wait longer to hike again brought some bearish vibes. PPI readings and a handful of medium-tier reports are due from the U.S. this week, which could leave sentiment in the driver’s seat once again. Read more. The Loonie also had a mixed run but was able to draw a bit of support from a not-so-downbeat BOC statement and a positive week for crude oil. Canada’s CPI release on friday might be the main event for the currency, although of course there’s overall risk appetite to keep tabs on. Read more. Medium-tier reports didn’t exactly paint a rosy picture of the euro zone economy in the previous week, leading many to push ECB hike expectations further back. There’s not much in the way of major releases from the euro zone this time, which might leave the shared currency and the Swiss franc vulnerable to risk flows. Read more. Sterling managed to pull through with some gains towards the end of the week as traders probably priced in expectations for this week’s vote. By the looks of it, many are still hopeful that the U.K. government winds up dropping the idea of Brexit altogether as parliament would likely reject the Withdrawal Bill. Read more. Unwinding might still be the name of the game for the yen as it found itself at the very bottom of the forex pile. Of course a string of weaker than expected data also brought on bearish action. This time, yen pairs might take directional clues from overall sentiment and counter currency action, as there are no major reports due from Japan and events in other economies could steal the show. Read more. Weak data? Who cares? The Aussie managed to shrug off disappointing trade data and building approvals figures as the focus was on U.S.-China trade talks. Expectations of stimulus from China and more optimism for the next round of trade talks might keep the Aussie afloat throughout the week, even though there are no major reports on deck. Read more. The Kiwi found itself at the top of the heap, thanks mostly to risk-on flows in anticipation of trade talks between the U.S. and China. There are no major reports due from New Zealand this week, which leaves the Kiwi sensitive to overall market sentiment once again. Read more. First up is this neat rising channel on the long-term chart of USD/CAD. The pair is in the middle of a correction and is currently testing the 50% Fib at the mid-channel area of interest. Buyers might be ready to return as stochastic is indicating oversold conditions, possibly leading to a move back to the swing high or channel top. 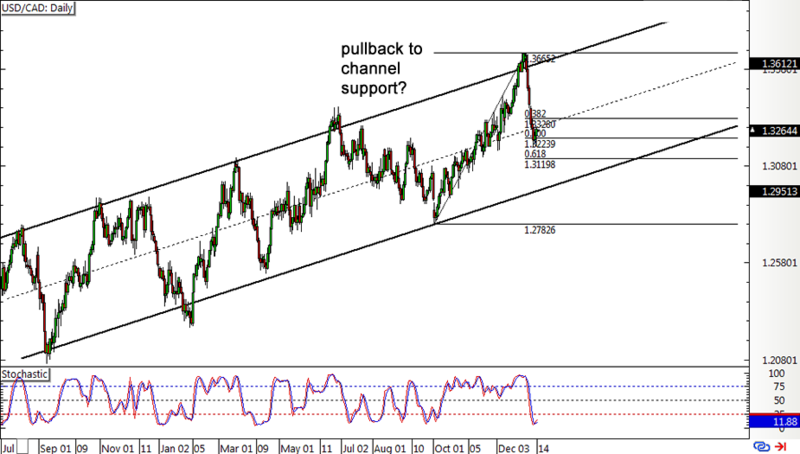 A deeper pullback could still test support at the bottom of the channel or the 1.3000 handle. Next up we’ve got the classic break-and-retest setup we were watching last week start to play out on the 4-hour time frame of GBP/AUD. 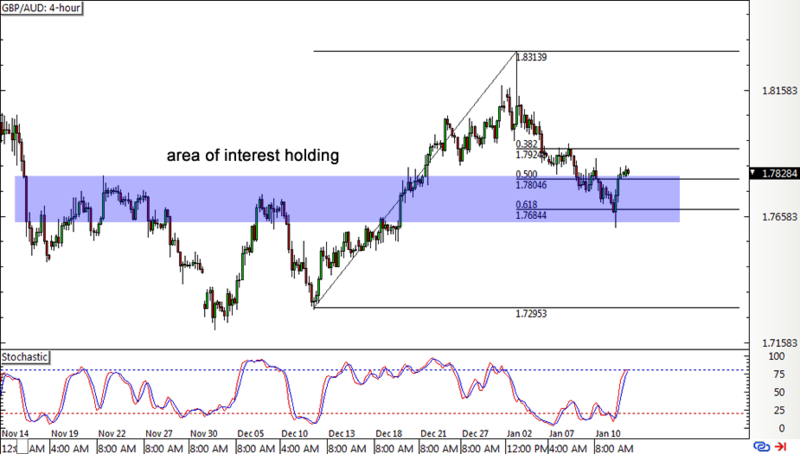 The pair already seems to have bounced off the former resistance zone around the 61.8% Fibonacci retracement level. Sustained bullish momentum could take price up to the swing high at 1.8300 and beyond. However, stochastic is closing in on the overbought region to reflect potential exhaustion. 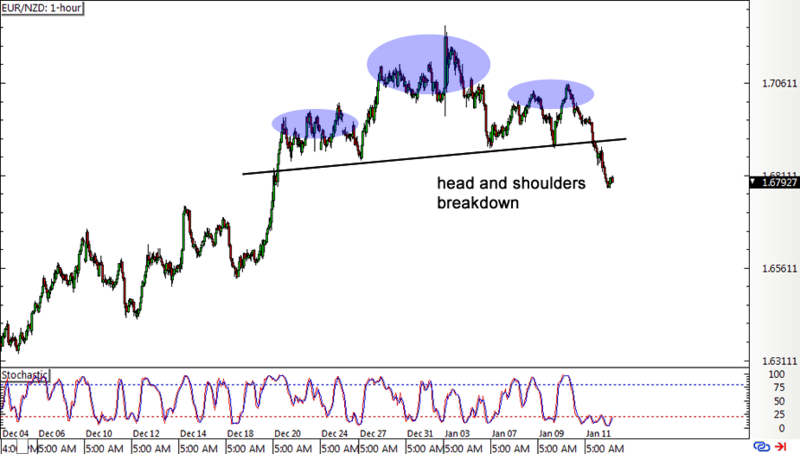 Last but certainly not least is this head and shoulders breakdown on the 1-hour chart of EUR/NZD. There might still be a chance to catch the move as price might be in for a drop that’s the same height as the reversal formation. Keep in mind, though, that stochastic is indicating that sellers are tired so a bounce might be due. This could offer a pullback scenario to the broken neckline support before the pair heads further south.